Abstract: G protein coupled receptor (GPCR)-mediated pathways are critical for cells to respond to intercellular and environmental cues, and are a major focus of drug discovery efforts, particularly for cancer treatment. The molecules that activate GPCRs, and the resulting signaling cascades triggered by associated G proteins, are diverse. Fluorescent dyes and biosensors can be used to monitor changes in second messenger levels, including Ca2+ and cyclic AMP (cAMP), in response to GPCR activation. 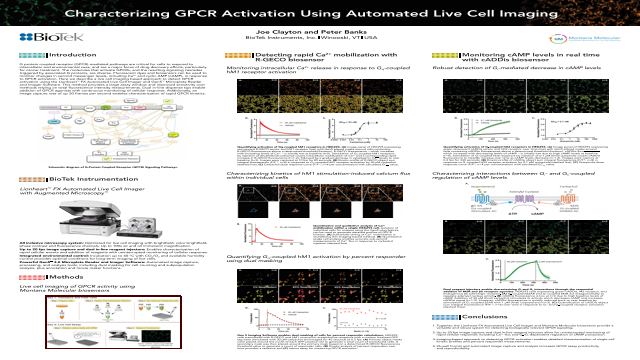 Here we describe a live cell imaging based approach to detect GPCR activation using the Lionheart™ FX Automated Live Cell Imager and Gen5™ Microplate Reader and Imager Software. This method provides a large assay window and improved sensitivity over methods relying on total fluorescence intensity measurements. Dual in-line dispense tips enable addition of GPCR agonists with continuous monitoring of cellular response. Additionally, an image capture rate of up 20 frames per second enables characterization of rapid GPCR kinetics. Summary: Here we describe a live cell imaging based approach to detect GPCR activation using the Lionheart™ FX Automated Live Cell Imager and Gen5™ Microplate Reader and Imager Software.References: 1. Together, the Lionheart FX Automated Live Cell Imager and Montana Molecular biosensors provide a versatile and robust system for detecting biologically relevant GPCR signaling. 2. Up to 20 fps image capture and dual in-line reagent injectors allow for uninterrupted monitoring of rapid cellular responses including Ca2+ flux and Gs/Gi-dependent regulation of cAMP production. 3. Imaging-based approach to detecting GPCR activation enables detailed characterization of single cell kinetic profiles and percent responder measurements.